Hello. When I was growing up, I thought MLK Jr. was the son of German reformer Martin Luther. Anyone else think that? Anyone else think that Austria was just shorthand for Australia? Or that China was Asia?! Or that Kill Bill was Saw?! Don't look at me. Look at SF Unified. Anyway, I'd like to work through specific places where MLK's theology brings helpful clarity and even hope to the Asian American experience, but I'd like to try to do that without excavating his convictions from the Black framework that he lived in. I think it's important to try, though, because King's vision for economic and racial justice was consistently global while powerfully local, it is what made him an international force and a uniquely Black prophet. King speaks about the "amazing patience" that the Black community endured throughout the course of American history and there is a sense that suffering produces more than just raging power for the oppressor. For victims of institutionalized racism and violence, endurance was not simply a natural byproduct of passivity, but a hardening possession of strength and of tolerance. The Black experience was not merely acted upon by white supremacy, it was agitated, refined, and pressed together by a precious consciousness that was alive and awake. King's calling to the Black community was not to say that the days of patience were over. Instead, he invited them into a greater level of endurance that only they could survive. He led them not into security or safety, but into struggle. King shows me that I have so much to learn about how to struggle. He shows me the bravery of Black men and women who move from an amazing patience to a gracious endurance. And it is not patient or gracious to appease those in power; it is patient and it is gracious because it is formed in the sacred underbelly of suffering. It is familiar with the long journey and daily choice to walk out with tired feet. King tells a story of a pool driver that stopped beside an elderly woman during the Montgomery bus boycotts. The driver sees how hard it is for her to walk, and offers her a ride: "Jump in, grandmother. You don't need to walk." And she waves him on saying, "I'm not walking for myself. I'm walking for my children and my grandchildren." And she continued toward home on foot. As a leader, organizer, and activist, King's hopes aren't anchored solely to the national political opinion. He cares as much for the transformative spirit of his community as for the legal victory. He sees, in this grandmother, an arc of empowerment and hope that extends further than his day. He shows me that my activism must be big enough for my children and my grandchildren and that my resistance is cultivated not by victory but by trial. The slow, difficult, and prayerful trial. I faced a new and sobering dilemma: How could I make a speech that would be militant enough to keep my people aroused to positive action and yet moderate enough to keep this fervor within controllable and Christian bounds? King's moderate balance isn't a question of neutrality or political fairness. It isn't about remaining unbiased. In fact, it is a call to be incredibly biased according to the dignity of man, the edicts of God, and the doctrine of love. While he is not unaware of the powerful tendency to lean to each extreme, King strives to lead in a tension that is rooted in what it means to love. The problem with white moderates isn't that they are silent. It is that they have lost the courage to love. - I want to understand the Asian American experience of struggle as a place of formation and cultivation rather than shame and voicelessness. - I need to come to terms with the reality that this journey is never not tiring. There is still something powerful, however, about the legacy of tired souls, the weathering of tired feet, and the unison of tired voices. - I hope to be unafraid of the militant middle, to both fight and extend compassion with the same purpose and urgency. And honestly, my biggest fear isn't that an extreme will win out (I think that might actually feel better?) My biggest fear is that the middle is lonely and misunderstood. My Auntie Betty is the oldest of five siblings, specifically, four brothers. We were driving home from a memorial banquet when she blurted out an observation from the middle row seat of my Honda Odyssey. "You know how the Chinese are; boys, boys, boys." This sabbatical, I'm tracing the faith development that happens in immigrant communities between mothers and daughters. 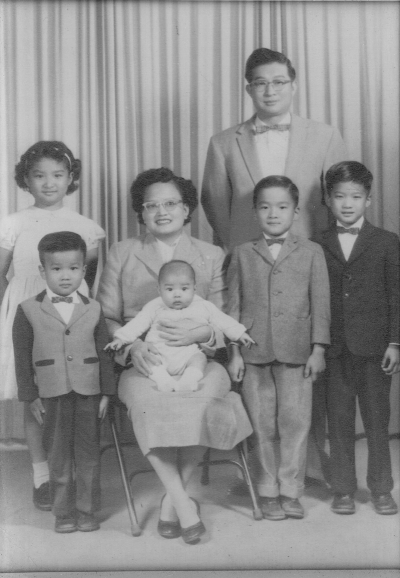 I have so much to write about what my mom has taught me, the recipes my grandmother cooked, and the legacy of Chinese women in my church community. I have so much to write because I know that so much of my story is shaped by strong, brave, faithful women. At the same time, I know that each generation is not left unaffected by a socio-cultural framework that is molded by systems of patriarchy and oppression. "Boys, boys, boys" is something my sister, mom, and I still mutter to each other when we are confronted with small reminders that we are living in a system made for our husbands, fathers, brothers, and sons. - When Jon and I found out we were having a baby boy, multiple people said that our parents must be so glad. Like in that way where daughters are fun, but sons make sense. - When I think about where to live in the next 5-10 years, I calculate what kind of health my parents and in-laws will have because a daughter knows someone always needs to be near home. - My mom continues to daily care for her aging sister because a daughter knows that even after her parents are gone, she is still a daughter. - There is an expectation that women in my family will always be present to facilitate and engage in group settings, while similar participation from male relatives is excessively applauded. Apart from family life, I've observed from both ministry and seminary that Asian American males also have more permission, opportunity, and mentorship. In fact, while many have been largely shaped by Asian American women (as Sunday School teachers, colleagues, or supervisors), they can be quick to take credit for the sake of advancing the general Asian American voice. Articles like Nate's that give honor to influential Christian women are rare among Asian American writers. This is where I'm torn. I long for my Chinese American brothers to thrive. I know that I am just as shaped by my grandmother's dumplings (hah! literally!) as my grandfather's egg foo young. I know that the sacrifice of my grandmothers who worked in sewing factories is paralleled by my grandfathers that worked tirelessly in school cafeterias and liquor stores. Chinese American men in my life are strong, passionate, and creative. I also know that there is a unique burden for Asian American men who are repeatedly emasculated and written off. And so I am working out how to lead as a Chinese-American woman alongside the painful struggles and unjust privileges of my Chinese-American brothers. I am searching for a new way forward. Despite living in a "boys, boys, boys" world, somehow my Chinese American community functions in a largely matrilineal way. That is, despite the overwhelming ways males receive preference (i.e. bearing generational family names, receiving inheritance and communal approval, largely avoiding family obligations that daughters often bear), most families revolve around the oldest grandmother or great-grandmother. I have theories! This comic actually makes me wonder if Asian women gain power within the community once they become frumpy, permed, turnips. No really, it is possible that the Asian community reserves a special place in their hierarchy for women who wear brown velour track suits and fleece beanies. Essentially, there is an expectation that Asian women will carry simultaneous duties as daughters, sisters, mothers, employees, etc. for the first 60-ish years of life. After that, she earns her Popo badge- she is seen as a family sage: wise and generous. My hope is that this generation of Asian American men might see their sisters for who they truly are today, even if they are still imperfect, ovulating, and have great skin. I long to see Asian women understood as leaders and dreamers. To be accepted when they express disappointment and limits. To be able to be as multi-faceted as we hope we can urge our Asian brothers to be. Imagine the kind of Popos we will be when our wisdom and generosity is shaped not by decades of silence, obligation, and disdain, but formed by mutual empowerment and trust. Here's to the dreams we can offer our sons and daughters- to be known and held, celebrated and welcomed, to jointly carry on heritages of bravery and generational hope. I wrote an article for Inheritance Magazine. I wonder what it feels like to make a home in a land where the words you dream in are never recognized in the waking world around you. When the tones and inflections that have evolved for centuries- passed along on mothers' tongues as far back as the continent itself are cut off abruptly. Much like setting off for a road trip and the radio suddenly switches to a new station, unrecognizable but sufficient. From where I stand, my monolingual reality is pretty simple. I'm third generation, I often explain to others, so my parents barely speak Chinese themselves (though, to be fair, my mom's is like a million times better than my dad's. no offense dad) (ack, to be fair again, my mom once translated the apostle paul to pineapple bun for our bilingual service) Again, my parents barely speak Chinese themselves. And I have often put myself in my grandparent's shoes to consider this reality- that it was preferable or even necessary to effectively erase the Toisan from my family in order for them to be American enough, assimilate-able enough, White enough. This reality meant that for the 18 years I lived with my grandmother, our chit chats were to fix remote controls and to wear warm jackets. It was the insistent cry that American progress could not have 5 distinct tones, just long and short vowels. This linguistic ultimatum leaves me without words these days. I'm grateful, in a lamenting way, for the deep and sacrificial love that sustained my grandparents as their children dropped out of Chinese school one by one. They had no actual choice, really, and they knew that every generation gives up something. But it trickles down to me and now my feelings are changing because can I just say that that's not okay? Because for every family that tried to pass down their native language, their children were placed in ESL classes and were never expected to perform as well as those who had chosen to forget. For every time my parents felt shamefully desperate to draw the line between themselves and the immigrants, owning their American-Born-ness and holding at arms length their Fresh-Off-the-Boat-ness. And because I was so proud, so ignorantly pleased, with my white washed words until I realized they left me and my future children indefinitely deprived of tones, the 5 distinct tones that meant the most to me. And it trickles into our worship. Along the way, when did we make a choice to buy into a form of evangelicalism that required we prove we were American enough, assimilate-able enough, White enough? See, we arrived at a time when our survival required our forgetfulness and our silence. We carried no freedom songs, no gospel hums, no familiar instruments. And as we took the stage, our hymnals, projector transparencies, and CCLI Power Points could not specifically express the work of God in our stories, but embodied our ernest desire to play like, sound like, worship like Americans. The familiarity of songs like Shout to the Lord, Power of Your Love, and Not Be Shaken* are, in many ways, the Asian American worship voice- they represent a simultaneous desire to be known by God and by our country. Without articulating our own voice, these songs represent the sickness of a model minority curse as it has found its way into our pews. That being said, I get it- this is where I am now- a monolingual Chinese American who can author this blog post in a language I'll teach to my daughters some day. I just want to remember, before I continue a legacy of forced forgetfulness, that there was a moment in my family's story where we held both languages together and in it was wrapped the stories and promises for a coming day. And after exclusion acts, and yellow peril, and oriental fetishes and ching chong cho, these were the songs we were left with. My auntie Susie, Popo, and Auntie Rose in front of Francisco Middle School. Wow I don't think I have ever or will ever look as fly as my grandmother. My sabbatical is supposedly beginning in 105 days, so instead of watching my third episode of Law and Order or eating more ice cream, I will start this website. Here it goes? For now, this blog is a secret space and that's good for my Enneagram 2-ness.